Great start. I’m a relative Star Trek Newb and I know even less about DS9, but I’m still intrigued, so that probably means it was a pretty effective first episode overall. Bring on Episode 2. Awesome first episode, guys! Everything sounds so crisp and professional. Where’d you get the music from? As for the story, I’m really looking forward to more. I used to watch TNG, Deep Space Nine, and Voyager when I was a kid (yes, I’m a young’un), and listening to this made me get all nostalgic, especially the dramatic music underneath the reveal (and the reveal itself!) at the end. Can’t wait for the next episode! The music is from a few Star Trek soundtracks I have. Deep Space Nine, Enterprise, Nemesis, and Generations to be specific. Hi! I’ve just added your audio drama to my listings of Star Trek Fan Audio at Star Trek Reviewed, vis: http://startrekreviewed.blogspot.com/2009/06/247.html . Glad I was alerted, and I’ll try to keep your listing there current! I haven’t listened yet (I have watched and listened to less than 1/3 of my listings, so please forgive me) but any information that better describes your work (a year, for example, confirm that it’s DS9-based) would be great, so that my users (I have more than 1000 separate visitors a month who average more than 6 pageloads each visit) can enjoy your work long before I catch up with it! Sounds very promising! Thanks! I hope you do enjoy it when you get to it. 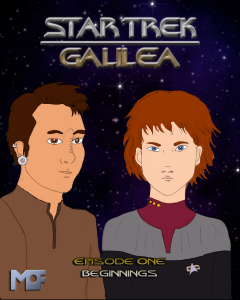 Galilea is set in 2380, after the events of Star Trek: Nemesis but before the supernova that destroyed Romulus. It follows Commander Brunhilde Engelstadt, coming back to active duty after a leave of absence after the Dominion War, and her first mission as First Officer of the U.S.S. Galilea, a planetary research vessel. Thank you! I’ve added that comment to your listing at Star Trek Reviewed Audio Drama http://startrekreviewed.blogspot.com/2009/06/247.html (alphabetical order). With it, I hope that people who look to those listings to keep them in Trek as they travel in their cars or listen to their ipods on mass transit will more easily find your work.